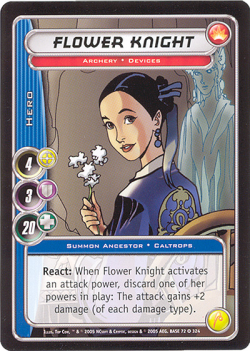 The most recent CCG (not LCG or other Munchkin-style box set) that I bought for myself (not my daughter) was going in with a couple friends on a box of City of Heroes CCG. It only had two sets (and BoardGameGeek doesn't even list the second one! ), so it can't really be called a success, but it had several neat mechanics, so I hope they reappear in other games. Let's walk through them. First, they had an interesting take on the "starter product". In addition to the usual 11-card booster pack, they had 25-card "battle packs", which did double-duty as starter decks and draft packs (presumably adding regular boosters). The battle packs are rigged (DS9 starter-style) to ensure you get a hero, along with that hero's signature powers and enough general cards to make a generally useful deck. We've been just playing pack v. pack thus far, and it works surprisingly well. In particular, look at that the number on the middle-left side. (Snap Shot has a 1, Blazing Arrow has a 2). What that number does is tell you how many times you need to recharge the power before you can use it again. (Recharge = "untap"). So, Blazing Arrow does more damage, but it needs to untap twice before you can use it again, while Snap Shot becomes available after every refresh. Third, the turns are very quick, and it's due to a very interesting design decision. On your turn, you do one thing. And.. that's it. There's no separate draw step, no separate attack step. You can draw OR attack OR play a card OR recharge your powers. This has two effects - it makes multiplayer go very fast, and it gives the game a real-time feel. You can press an advantage to a point, but eventually you'll need to stop attacking and recharge (and probably draw cards as well), which gives the opponent a chance to catch up. Fourth are the inspirations (the little icons on the bottom-left corners of the cards). These are all extra little abilities, and you can discard a card from hand to get them. They're also the only "interrupt" speed plays in the game. (Some powers have abilities once on the table, but those aren't really a surprise). They do fairly simple things (heal some damage, make attacks hit/miss, etc), but they do two important things. They give a use for the extra copies of powers in your deck (you can only have one copy of each power in play), and it gives you a way to swing the tide in a hurry (preventing Pokemon-syndrome, where you know four turns out that you're going to lose). She has two powersets - Archery, and Devices. (There's a whole mess of powersets, covering pretty much every superhero trope). She can *only* use powers from those two sets. No energy blasts or claw attacks from this lady. 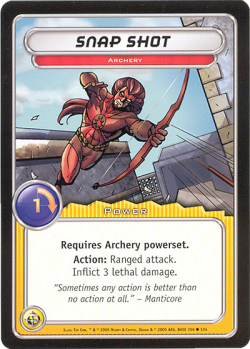 (The game also allows you to stock Sidekicks if you really want access to other powersets in the same deck). So, many of the really disgusting combinations are locked out by virtue of there being no heroes with that pair of powers. 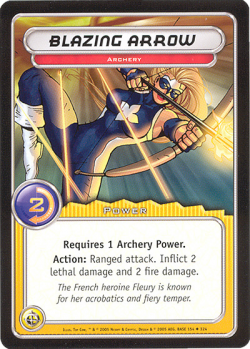 The four "make your own hero" cards even restrict what combinations you can pick, for the same reason. (Smart move on their part).